The rice was cooked like paella along with the vegetables and the broth, but it’s definitely not paella. It’s a simple dish that would fit in the category “comfort food” even though I don’t like to think of food as being comforting. It makes me feel that at some point, it replaces a friend and that is a strange perception. I don’t think there is a translation in French for “comfort food”, I would think the closest word would be “appaisant” or “calmant“, appeasing? calming? The presentation is not that delicate, nor elegant, but it is indeed colorful. This is one of those dishes you really enjoy when you have a craving of rice, seafood and greens but also when you don’t have time to “take care” of your dish. It just cooks by itself with no surveillance. In a week from today I will be on a flight to go home, let’s hope by then the bad weather will no longer be bad…so that means eating a lot of seafood. In France during the Christmas holidays, seafood is all over, crab, lobster, oysters, etc…and its the time of the year when seafood it’s the freshest. Heat olive oil in a large pan. Add shallots and garlic, stir. Add vegetable julienne, and cook for about 5 minutes. Add saffron and stir. Add rice. Coat the rice with oil. Add broth where saffron had been infused. Then add squid. Adjust with salt and pepper. Cover with a lid and cook at low temperature for about 15-20 minutes. For the spinach, heat olive oil in a pan, add garlic. Stir a little without burning the garlic, add washed and drained spinach. Adjust with salt and pepper. Cook until the spinach are soft. 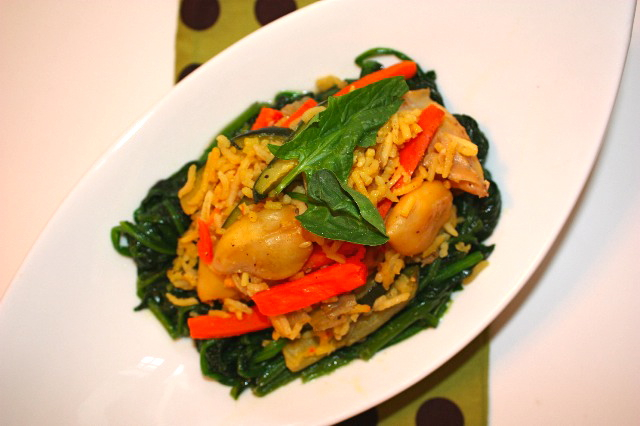 Divide spinach in each dish and spoon over calamari-rice on top. This entry was posted by silvia on December 22, 2010 at 5:01 am, and is filed under Fish/Seafood. Follow any responses to this post through RSS 2.0.You can leave a response or trackback from your own site. yes, so colorfull,like this day before christmas!merry christmas,silvia and a happy new year! Silvia honey, how are you? Wishing you & your family a Merry Christmas & happy new year. Guess, you have been busy lately. Have a safe trip back home and have lots of fun. J’aime bien ton plat. Cela semble délicieux. J’espère que tu es prête pour les fêtes. This looks marvelous!!! You always have the most amazing recipes. That loos like comfort to me! I hope you have a relaxing holiday season! Yum! I hope you have safe travels back home…and I hope you enjoy all of that seafood. Yum! I think that this dish looks and sounds spectacular. I want a plate right now. Thank you so much for sharing. I hope you have a wonderful end to your week. Happy Holidays! mmm, such a flavorful and healthy meal around the holidays. have a wonderful trip home and happy holidays! Some things are impossible to translate ” le repas apaisant” I can see French-speakers looking puzzled here! Anyway, great rice dish, not just comforting but delicious! J’aime beaucoup le riz safrané. Le tien est délicieux. Certaines expressions sont difficiles à traduire! This looks like comfort food indeed and I don’t mind tentacles one bit! Hope you’re having a wonderful time in France. Happy New Year, Silvia! I love the fennel and the vegetables you’ve used here. I’m not sure where I could get squid, but I’m sure I could substitute another seafood. Really lovely dish. Bonne Année 2011. Je reve des Noels en France….Ah, les huitres et les coquilles Saint jacques! Si seulement Noel pouvait etre au printemps, ce serait parfait! I will never get Dr Lostpast to touch squid… but on a dinner he is out I will soooo give this a try… great flavors and it looks so delicious! How are you Silvia? Trust you are going great. Great to know you are going back for vacation. I’m sure you are going to have great fun. Ohhh, that looks so wonderful! I just love the ingredients in here (including squid) I don’t know where I would find some here in Phx. tho ;( I’ll have to check around. This will be perfect to satisfy my paella cravings!